We rescued Walt a little over 3 years ago. When we first took him to the vet, they thought (based on his teeth, size, etc) that he was probably about 9 months old. They said that meant he was probably born in July and asked us to pick a birthday for him. 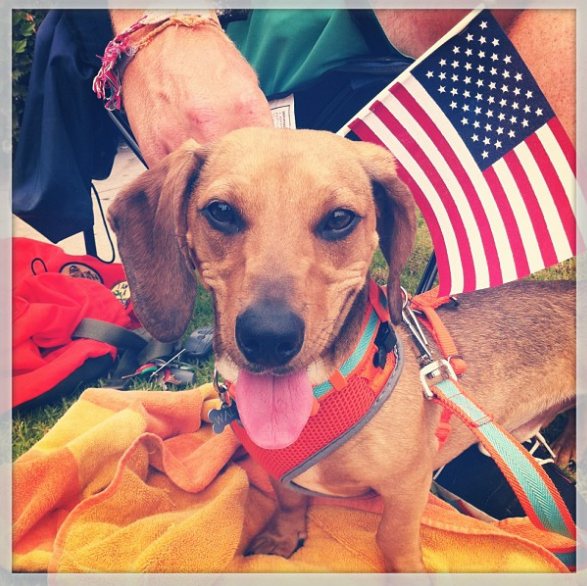 He's our Fourth of July doggy! So this past weekend we had a BELATED BIRTHDAY celebration for Sir Walt the Wiener Dog. We started with a fun morning hike at a nearby park. 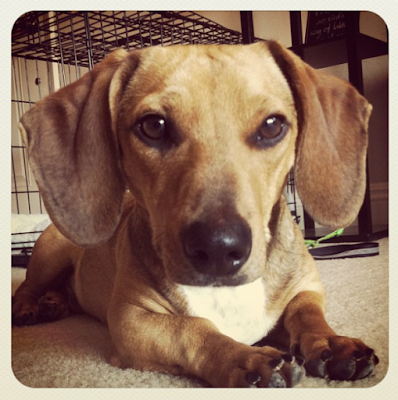 We've got a talented wiener, what can we say?! And then I think he looks like he is smiling! He may not be speedy, but we had fun! Always make sure to hydrate your wiener! Then, once we got home and ate some food it was time for a quick shut-eye on the porch with his main man. Ryan is building a box out of pallets for me (to store our throw blankets in) so we accompanied him to the garage for some supervising and stick chewing. Don't worry, I didn't chew on any sticks! HA, doesn't it look like he is hunting the ice cream in this shot?! I guess you could say he liked it... He ate it all up! Again, I doubt he knew any better that we were celebrating his birthday (or that we were celebrating it late), but hopefully he felt all the love we have for him! He's a great pup (most of the time) and he has brought us such joy! Do you celebrate your pet's birthdays? This may be my favorite post you've done! I LOVE running but I also LOVE dogs. My husband and I will be running down the street and see a dog and we both have to mention it. And yes, I am one of those WEIRD dog people who makes my dogs b-day cakes or pupcakes. (We do have two dogs though, and we usually only go all out for one of them and the next year we go all out for the other.... Usually.) My Australian Shepard's 3 year adoptiversary is in 2 days and I may make him a cake. (It might not be on that day though.) He is a great running buddy and he has earned his cake by being my main running partner. Without him nudging me awake in the early AM, I may not have gone out for many of my early morning runs.